Greenhouses - Who Has The Best Greenhouses? 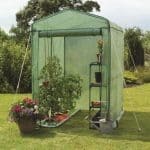 Greenhouses are among the most practical of garden buildings, allowing you to grow plants, fruit and vegetables all year round, even in our ever unpredictable British climate. Finding the right model for your needs, however, can be difficult. Do you want a wooden or plastic greenhouse, a greenhouse that has polycarbonate glazing, horticultural glass, or toughened glass? To make things a little easier, we’ve created this WhatShed guide to the very best greenhouses that can be bought online in the UK today. Just below, we’ll look at the criteria we used to select our twenty best greenhouses, but we considered many essential factors such as build quality, size, price and value for money, visual appeal, and practicality. 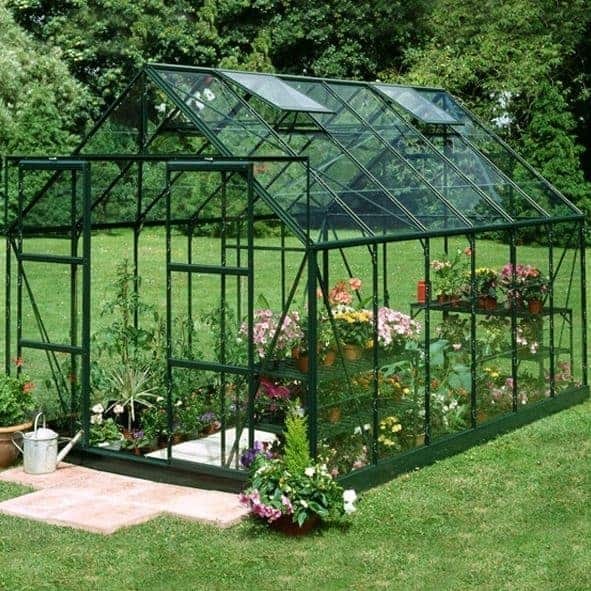 There are a huge variety of greenhouses available online, and we wanted our league table to reflect the diversity of this market, which is why it encompasses large and small greenhouses, wood and metal, stand alone and lean to greenhouses and even wall gardens and combination garden buildings. In this way we have been able to include superior quality greenhouses to suit all tastes and all budgets. With such a varied range to choose from, selecting an overall winner was a difficult task. It’s well done then to the 9 x 6 Ultimate Glass To Ground greenhouse. It’s far from the cheapest, and yet its classic design, great durability and long warranty period help it take top spot in our guide to the very best greenhouses that can be bought online in the UK today. Whether you want greenhouses or summer houses, WhatShed’s independent reviews can help you find the garden building that’s right for you. High quality greenhouses can come in many sizes and materials, and therefore the price can vary greatly as well. In our league table, we’ve been careful to include excellent models that are suitable for all budgets. Our table topper may not be one of the cheaper greenhouses here, with a price tag of nearly thirteen hundred pounds for a nine foot by six foot growing area, but it does provide excellent durability, good looks, and an ideal environment for growing plants, and it’s these qualities that grab the number one spot. 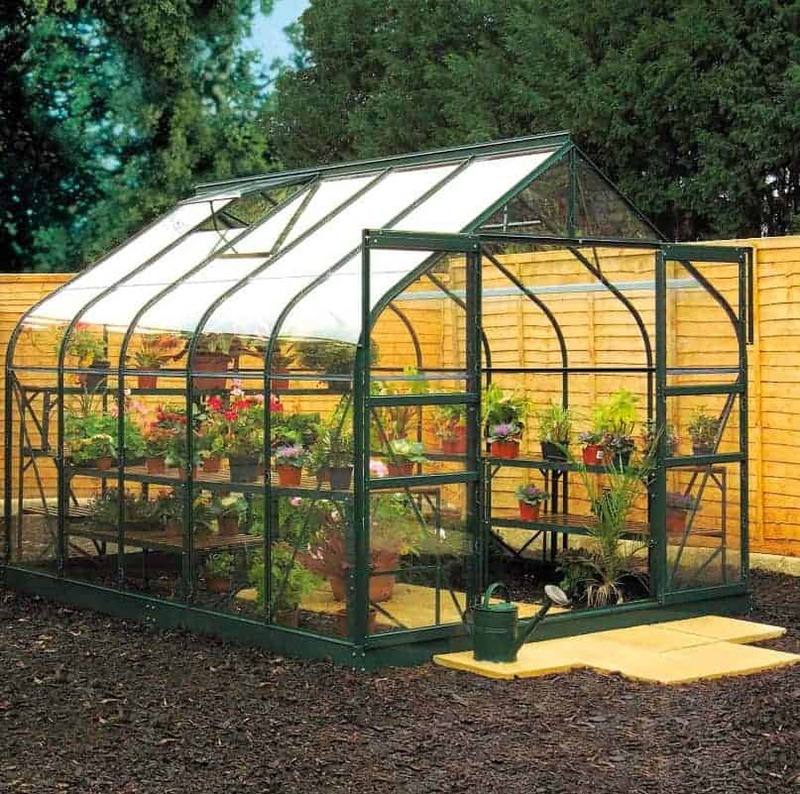 This is among the most traditional, and also most attractive, greenhouses we’ve reviewed. It has a wooden frame that contains glass from the ground upwards. This means that plants at all levels will be exposed to the benefits of sunlight. We were pleased to find that virtually unbreakable toughened glass had been used, and that the timber itself, at 45mm, was much thicker than we usually see. We were also impressed by the use of an initial pressure treatment on the timber, which means that the manufacturer is able to provide a very reassuring 15 year guarantee against rot. This is an important value adding feature too, and means that this greenhouse should retain its good looks for many years to come. These six foot by four foot greenhouses from Palram may lack the visual bells and whistles that some provide, but they do offer superb value for money, and they should prove to be tough and reliable too, which is what takes them into second place in our league table. The silver aluminium frame may not be to everyone’s taste, but we feel it has a contemporary feel that should fit in well with a modern garden. It should also feel strong and stable once assembled, and yet is also lightweight and easy to manoeuvre during the assembly process. Polycarbonate panels have been used for the glazing, and these should prove very difficult to break whilst being much cheaper than the toughened glass that was used in our table topping greenhouse. Polycarbonate is also better at retaining heat than the horticultural glass that we often see used, so it’s an ideal glazing form for people who are looking to purchase practical yet affordable greenhouses. The price tag of just over two hundred pounds also incorporates a 5 year guarantee, which we wouldn’t necessarily expect to see at this price. Another additional feature that really impressed us was the inclusion of a guttering system as standard, allowing rain water to be collected and then used for the watering of plants inside or outside the greenhouse. 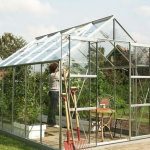 Greenhouses are an important addition to the garden for people who are serious about growing plants, but people who have a limited amount of space available may be forced to choose between having a greenhouse or a garden shed. 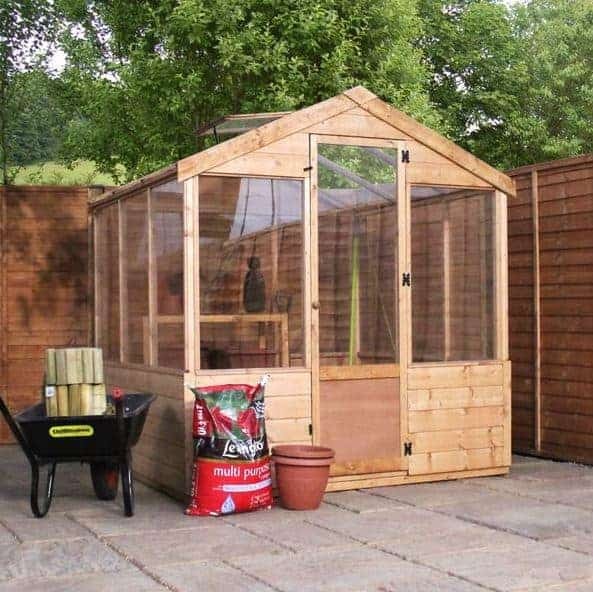 This combination garden building from Windsor offers a practical and eye catching alternative, in that it incorporates both a storage shed and a greenhouse in one space: the shed taking up the right half and the shed the left. It’s a solution that we were very impressed by, and with a 10 year warranty included as well, we think the asking price of less than twelve hundred pounds is not unreasonable. The shed itself feels spacious and welcoming inside, and we were pleased to find that its single hinged door has a key operated lock, making it a reassuringly secure place to store gardening tools and equipment. The greenhouse section uses styrene glazing between its softwood frame, with the lower section boarded to give added stability. This is one of the most original looking greenhouses that we’ve seen, as well as one of the most practical, and it’s these qualities that earn it a place inside our top three. 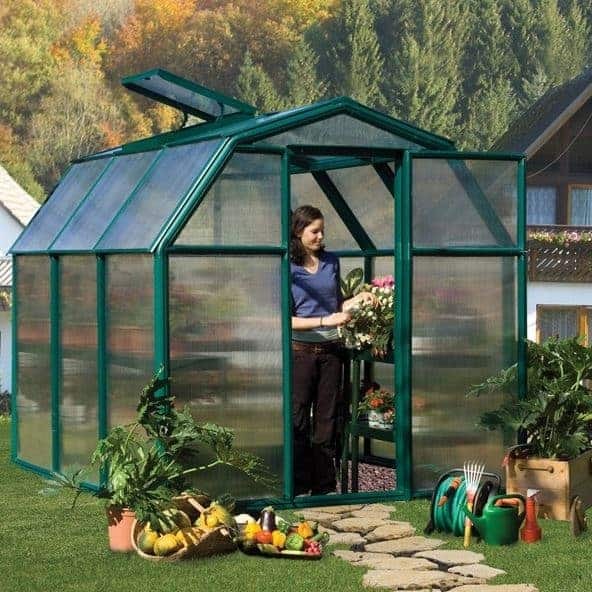 It’s a greenhouse and shed that is sure to attract compliments from neighbours and friends. We retain the wooden frame for the fourth greenhouse in our guide, but this time it’s used for a more traditional apex used greenhouse. The combination of softwood and glass is a very attractive one, enhanced both by the boarding across the lower reaches, and by finials at the front and rear. It’s also one of the toughest greenhouses that we’ve reviewed, thanks to a very strong and sturdy 70 x 45mm frame. For this reason, we feel this would be an ideal choice for gardens that are in exposed or frequently stormy areas, and it’s only the higher than average asking price that prevents this from being placed even higher up our league table. The wood used for the frame of these greenhouses is not only thick, it’s also very resistant to rot and insect attack, thanks to the initial pressure treatment that has been applied by the manufacturer. This is also the basis of a 15 year guarantee, which is something that we always like to see. Toughness and reliability are the key qualities of this greenhouse, and another sign of this is that the 4mm toughened glass used throughout is once again a little thicker than we often find when we review even the most high end greenhouses. This is especially reassuring if you’re likely to have children or grandchildren running around the building, or playing ball games nearby. For some people, the thought of installing their own greenhouse can seem daunting, and this can prevent them from experiencing the significant growing benefits that greenhouses can bring. That’s why this 5000M model from BillyOh can prove so useful. With an aluminium frame and polycarbonate glazing it’s very lightweight, and yet once fully assembled it should also feel strong and reliable. We were particularly impressed with the easy fit assembly system, where the panels simply slot into place along a guiding channel. It’s likely to be very easy to use, and should make the assembly process a lot quicker too, without the need for any specialist tools. This is the first of the aluminium greenhouses in our league table to feature green framing. It caught our eye from the moment we saw it, and it should blend in very well with a typical garden background. The galvanised steel base that’s provided is green too, and this should add strength and sturdiness to the greenhouse as a whole. We would have liked to see an extended warranty supplied, but at approximately four hundred pounds for a generously sized six foot by ten foot base area we still feel this represents very good value for money, and it’s this that elevates it into the upper quarter of our top twenty league table. There are few more garden buildings more visually appealing than a well built orangery, which is why we were delighted to see these large twelve foot by ten foot greenhouses from Palram utilise that classic design. The T-shape caught our eye from the moment we saw it, giving the building a cathedral like look. It’s not only a great environment in which to grow plants all year round, it can also become a much talked about and loved garden feature in its own right. This is one of the tallest greenhouses we’ve reviewed, being built to accommodate tall growing plants such as potted orange trees, with a ridge height of 2.70m or nearly nine foot. It should mean that the interior as a whole will feel very spacious and welcoming, and also very warm on a sunny day thanks to the use of polycarbonate glazing between the dark grey aluminium frame. We can easily imagine this being used as a kind of summer house or sun lounge, and there’s more than enough room to install some furniture inside. It can also be used as a place to entertain guests before or after a dinner party, and this dual purpose should be taken into account when considering its price which at first glance can appear to be higher than average. 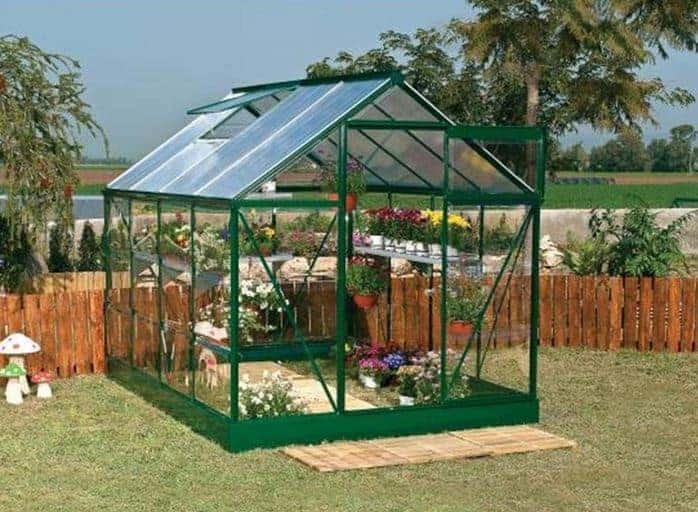 People who use greenhouses, especially if used for growing their own food, are often green in more ways than one. For the environmentally conscious consumer, considering their carbon footprint is an important factor when deciding upon which greenhouse to buy, and that’s just one area where this EcoGrow greenhouse scores highly. Its resin frame is also thick and strong, and this toughness is also emphasised by the use of twin walled polycarbonate glazing with a depth of 6mm. This provides excellent natural insulation properties, negating the need to add an artificial heating source during the colder months which again helps to create an environmentally friendly growing solution. We were very struck by the half octagonal roof, giving these six foot by six foot greenhouses a barn like appearance that we found very visually appealing. This roofing style also creates a little extra head room, which will be important to know for taller gardeners. With the introduction of appropriate staging and shelving this also means that there is extra growing space available. Equally impressive was the simple push and fit assembly system, and at less than six hundred pounds we feel it represents reasonable value for money for an innovative and good looking greenhouse with a 5 year warranty included. This is the second from the Ultimate range of greenhouses to make it into the top half of our league table, and once again we were impressed by both the durability and aesthetic appeal of the building. This particular model, however, differs in two ways from the version at the top of our table. Firstly, it’s larger, offering a base area of approximately eleven foot by eight foot, so it’s ideal for people who want to grow a lot of plants all year round, or even for those who want to grow plants on a semi-commercial basis. Secondly, these greenhouses have a half boarded rather than glass to ground design. This means that the lower half is covered by high quality softwood panels, and this gives it a very classic appearance that we found very appealing. We were also pleased to find that the wood has been given a pressure treatment prior to shipping, which is why it’s guaranteed against rot for 15 years. With toughened glass for the glazing as well, this should prove to be a very durable greenhouse, and also one that’s protected against the threat of break ins thanks to the addition of a secure key operated lock on the single hinged door. Only the high price stops this from gaining a loftier position in our guide. This is the first of our top twenty greenhouses that has a lean to design, and this brings with it its own unique benefits. The first thing that struck us was just how compact the greenhouse is, having an interior area of around four foot by two foot, and reaching a peak height of 1.60m, or just over five foot. 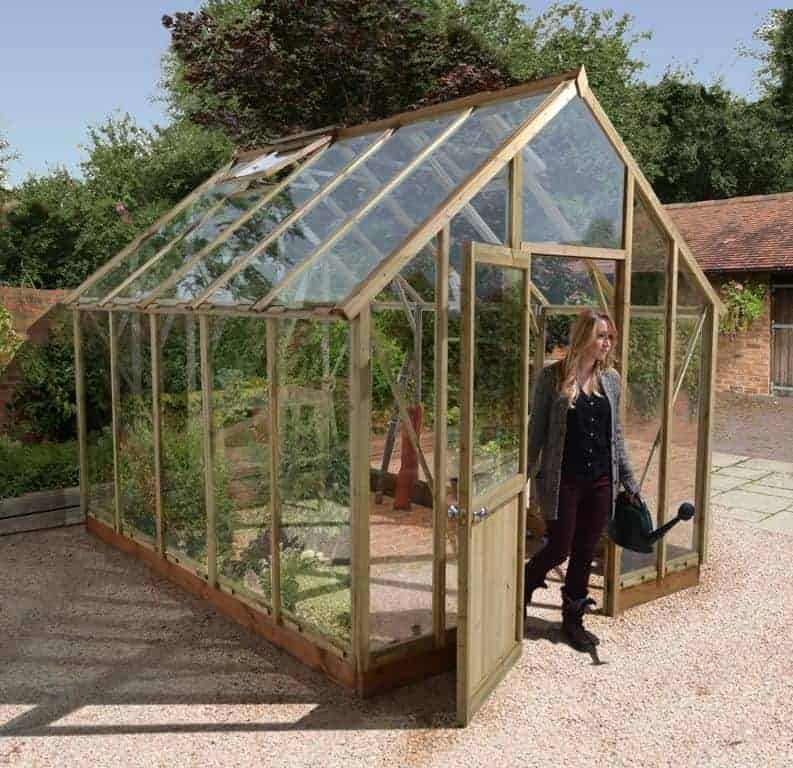 This still provides enough room to store and grow a small variety of plants however, and at not much more than a hundred pounds it’s by far the cheapest greenhouse in our league table. It’s this that carries it into the top half, especially as they should also feel strong and well built, and it comes with a gutter and wall mounting kit as standard. 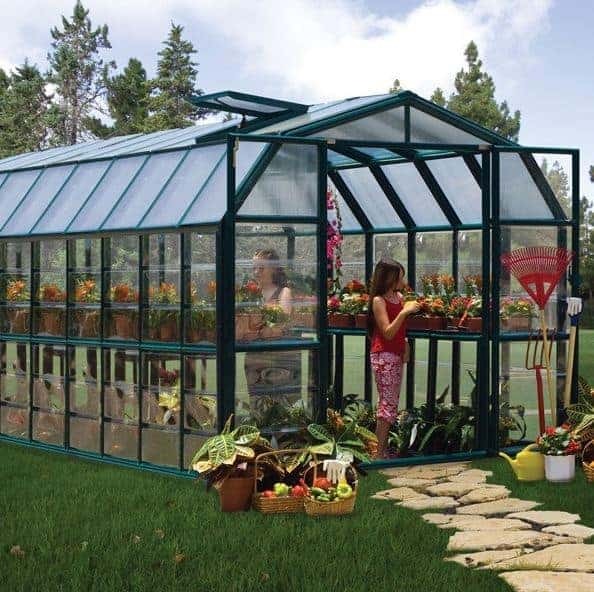 Because these small greenhouses are designed to be attached to a wall, they free up lawn space that would be occupied by larger and stand alone greenhouses. This makes them a perfect purchase for those whose garden space is at a premium. The supporting wall also gives them added stability, as well as protecting them from the elements. 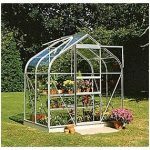 The design, based upon a silver coloured aluminium frame, may be too simple for the taste of some, but if you want a small greenhouse on a small budget then this is certainly worthy of your consideration. It’s easy to understand why plastic greenhouses are becoming increasingly popular, they are after all easy to assemble and yet very durable as well as being low maintenance growing solutions. 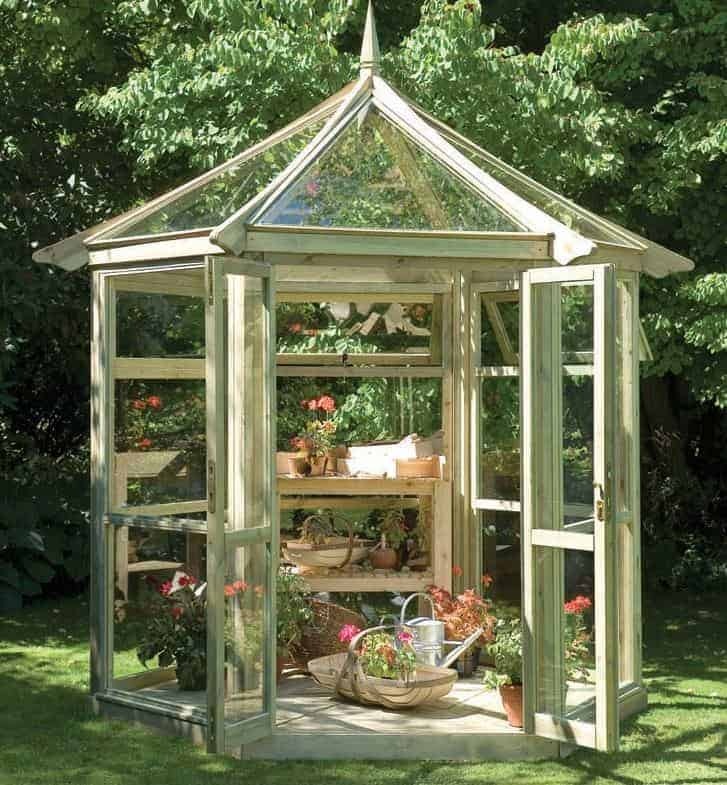 Many people, however, still prefer the classic look of a wooden greenhouse, and this Evesham model provides the stylish good looks associated with timber without the high price tag that can often come along with it. Its six foot by six foot base area puts it very much in the small to mid sized area, but with the addition of staging or potting benches you’ll likely be surprised by how much can fit inside. We were pleased to see that high quality 12mm thick tongue and groove cladding had been used for the frame, rather than cheaper and thinner overlap cladding. With 2.5mm thick styrene glazing used for the windows, we have little doubt that these greenhouses will be durable. Whilst a 10 year warranty against rot is provided, which we feel is a generous provision at such an affordable price, it should be noted that this is dependant upon the owner adhering to the annual treatment schedule. As the bottom portion of the greenhouse is boarded this can take longer than it would on many similar sized greenhouses that we’ve reviewed, but it should still prove to be a simple and quick task when compared to preserving a garden shed. We always admire garden buildings that have original and yet attractive looks of their very own, and these Buckingham greenhouses are a perfect example. While most greenhouses we review are either lean tos or have a rectangular design with an apex roof, this makes the most of a hexagonal design upon a base area of seven and a half foot by six and a half foot. We felt that it had a Victorian feel about it, and so it should make a stylish and yet addition to any garden that’s sure to attract envious glances from all who see it. The use of timber for the frame enhances this classic appeal, and we were pleased to find that the timber had been pressure treated to give it long lasting protection against rot. For this reason, the manufacturer is able to provide a 15 year guarantee, which is as long as we’ve seen supplied with any greenhouse. We were also glad to see that toughened safety glass is supplied as standard, and that three of the windows can be opened to provide easy and swift ventilation for your plants and seedlings on a hot day. The price tag of over two thousand pounds is the only thing that stops this taking a place well into the upper half of our WhatShed league table. These compact wooden greenhouses have the smallest base area of any to feature in our top twenty league table, at a little over three foot by two foot. They are also taller than many full size greenhouses that we see, however, reaching a peak height of 6’7, so it’s still possible to fit a good selection of plants, trays and seedlings inside, especially as it comes with two wooden shelves included as standard. 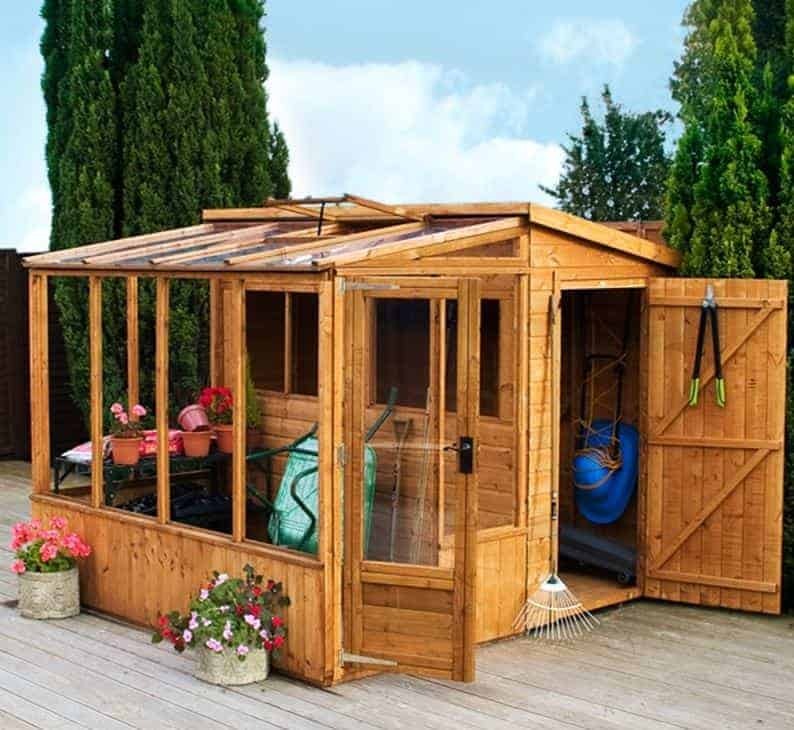 Despite its size, this is a very versatile garden building. Whilst the styrene glazed frontage is designed to be used as a small scale greenhouse, it can also be used as an outdoor display cabinet to be used as a garden feature. The lower boarded section encloses a storage area that is ideal for gardening tools, and can even accommodate objects such as bags of soil and grow bags. We found the sentry box styling to be very eye catching, and it should be even more visually captivating when it has a selection of plants growing inside. This could be an ideal solution for people who want an original and attractive growing facility in their garden that won’t take up too much space, and at less than two hundred pounds with a 10 year guarantee included, we also find it to be very good value for money. These are the second greenhouses in our league table to feature a lean to design, and once again this brings the benefits of freeing up lawn space whilst also giving added support and weather protection to the structure itself. This Silverline model, however, is a very different beast to the compact grow house that we looked at earlier. With a base area of approximately six foot by ten foot this offers all the lean to advantages and makes them available to people who need a true mid sized all weather growing solution. 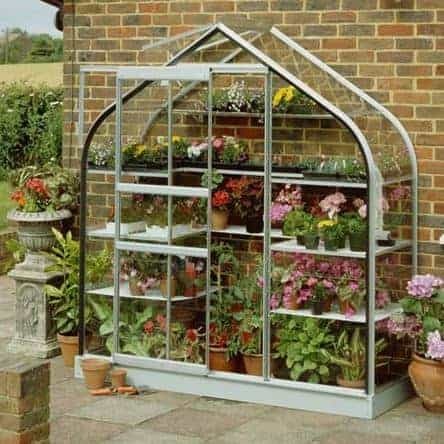 This is also among the most attractive metal greenhouses that we’ve seen, in either lean to or stand alone formats. We found the aluminium frame’s racing green colour scheme very eye catching, and its visual appeal is further enhanced by the curved eaves. We were also pleased to see safety glass used in this version, although it would have been even better if this had led to a warranty period in excess of the 10 years offered here. 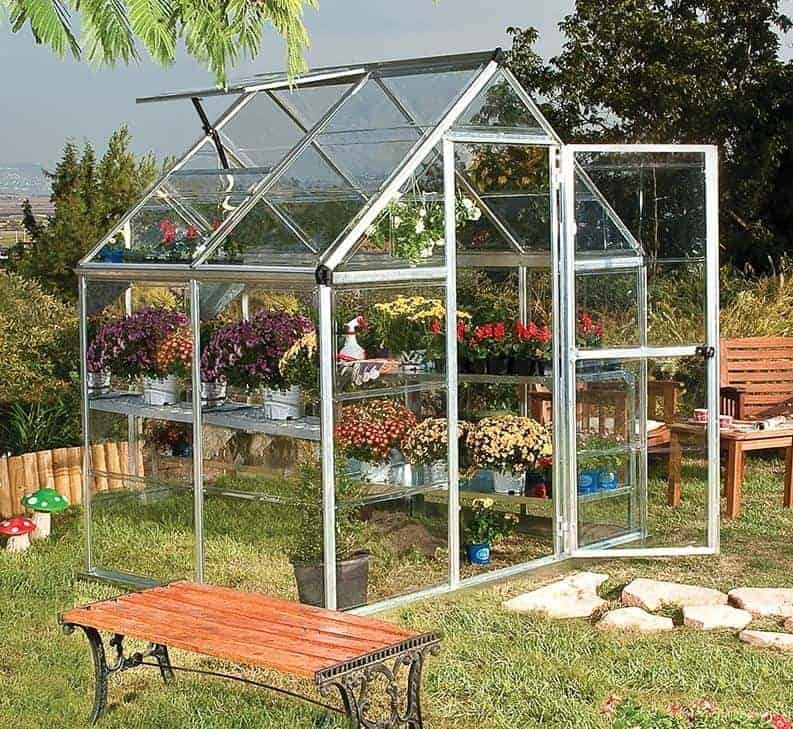 The price tag of nearly a thousand pounds also accounts for the position of this greenhouse in the lower half of our league table, but it still has a lot to offer to those whose budget it falls within. 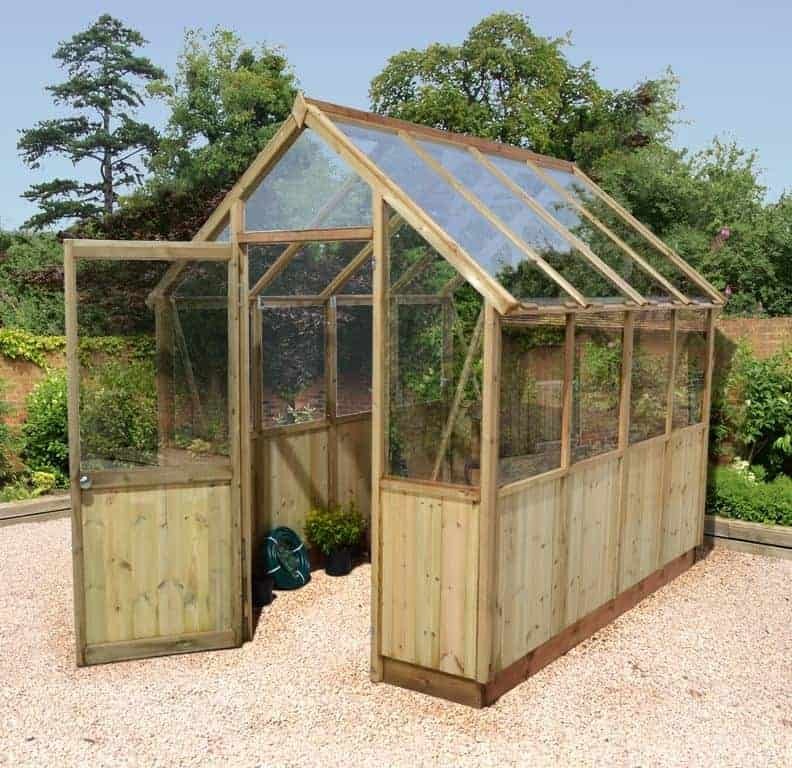 For such large and accommodating greenhouses, with a base area well in excess of twelve foot by eight foot, these provide very good value for money thanks to an asking price of less than a thousand pounds. It’s this that gains it a place within our top twenty league table, although it could have improved its position further with the addition of an extended warranty rather than simply the statutory one year period provided here. The price wasn’t the only thing that we found attractive about these Halls greenhouses, as we were also taken by the green painted finish that should fit in well amidst garden foliage. We were also impressed with the inclusion of four roof vents, which can be used to create a good airflow throughout the greenhouse, as well as for temperature regulation purposes. We were also pleased to find that it’s possible to upgrade the standard horticultural glass to toughened safety glass, although this does add £254.99 onto the initial price. Even so, we imagine that many people will imagine that this is a price worth paying, especially as it can negate the need to pay for replacement glazing panels at a later date and also relieves safety worries for parents of young children. This is the second six sided greenhouse to deservedly gain a position in our league table of the twenty best greenhouses that can be bought online in the UK today. 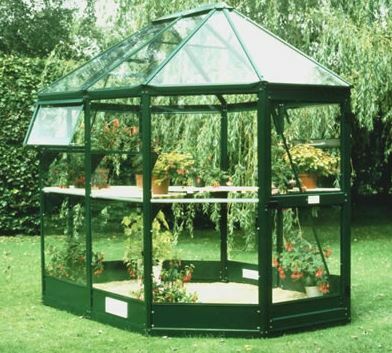 This Vitavia model, however, has a very different appearance to the Victorian style greenhouse that we looked at earlier. The first thing that differentiates it is that it’s bigger, being based upon an area of around seven foot by eight foot. This means that it’s large enough to use as a sun lounge, and with the addition of furniture two people can sit inside with comfort as they look out at the garden around them. Whilst this lacks the stylistic flourishes and detailing of some hexagonal greenhouses that we’ve seen, we still found it very striking. The aluminium frame has been given green paintwork, which we find always adds to the visual appeal of metal garden buildings, and the tall eaves height helps to ensure that this is an imposing garden building that draws eyes into it. 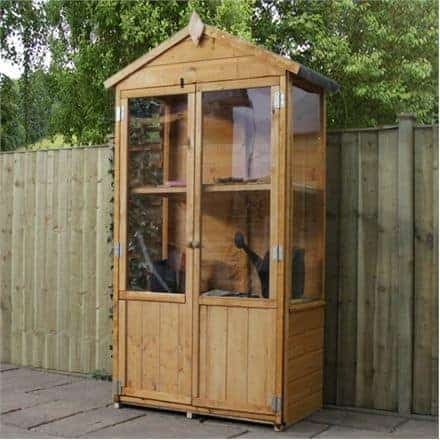 Whether you use it as a place to relax after a day’s gardening, or as a place to grow plants and seedlings safe from the vagaries of our weather, we feel this represents very good value at an asking price of less than seven hundred pounds. If toughened glass, rather than horticultural glass, had been used then it could have attained a significantly higher position. 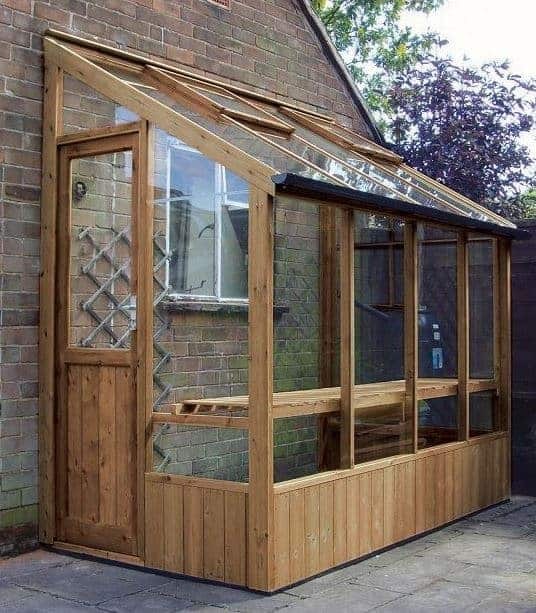 Wooden greenhouses may be one of the most traditional garden buildings, with a history that stretches back to the Victorian era, but as this 4’6 x 8’4 model shows, they are still evolving and making the most of modern technological advances. That’s because the Finch uses thermowood technology to preserve the wood and give it long lasting protection against rot that should last far longer than its 10 year manufacturer’s guarantee suggests. It’s a unique process whereby the timber is subjected to steam and high temperatures, and it’s very effective. It’s also a greener treatment option, which we were pleased to see, as it doesn’t involve the use of potentially harmful chemicals like tanalisation does. 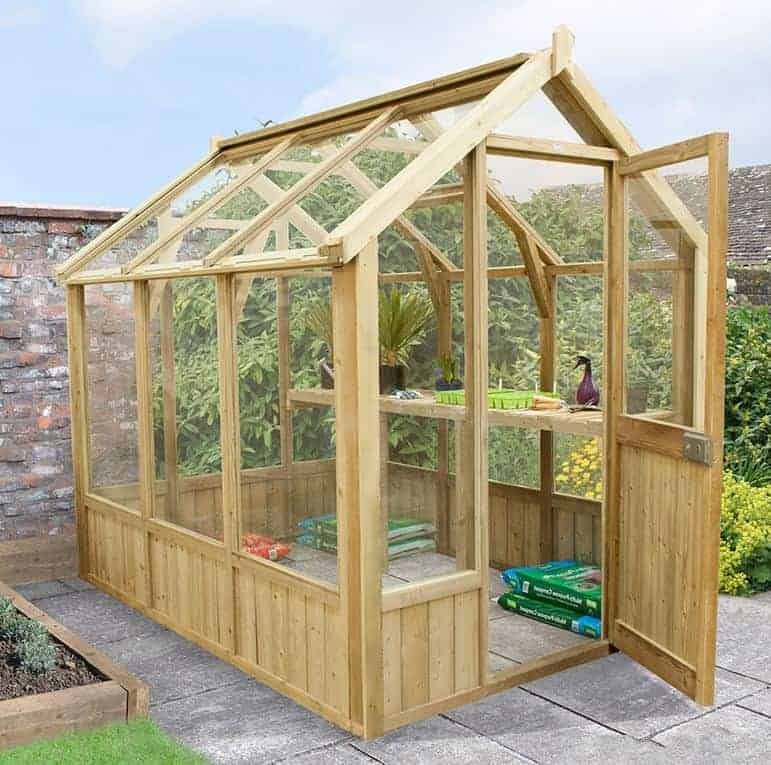 This is one of the most attractive lean to style greenhouses we’ve reviewed, thanks to its use of high quality smooth planed timbers, and the use of silicone sealed toughened safety glass. We were also impressed to find that it includes a PVC damp barrier, adding even more protection against rot and decay. There’s a full length row of staging included as well, meaning that you can start moving your plants and seed trays in as soon as the greenhouse has been assembled. 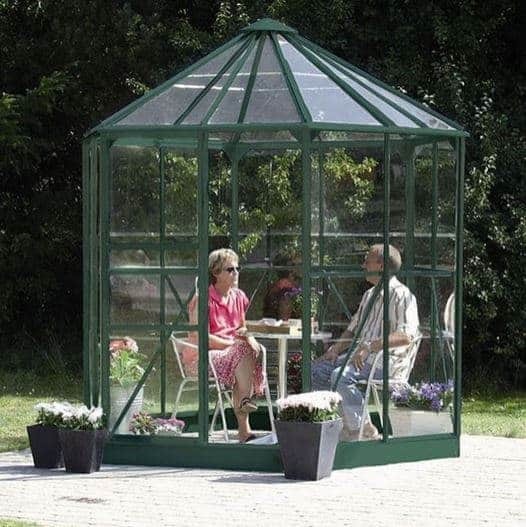 It’s not the cheapest greenhouse we’ve seen in this size, which accounts for its position, but it adds extra value with features such as its automatic opening vent. With a base area of around eight foot by twenty foot these are the largest of all the greenhouses to find a place inside our league table. This means that they could be an ideal purchase for people who want to upscale their growing potential, and for people who want to turn their gardening or plant growing hobby into a home run business. The sheer scale of this building, however, may make it unsuitable for people with small and even mid sized gardens, and the price tag in excess of two thousand pounds may also prove off putting to some. 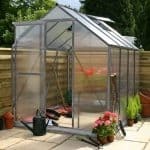 These are the reasons that it finds itself towards the foot of our league table, but if you have both the budget and space needed for this greenhouse then you may want to make it one of your first considerations. Greenhouses of this size need a strong frame to provide the stability they need, especially if they are going to be placed in a potentially windy area. That’s why we were pleased to find a thick and sturdy resin frame, and we were pleased to see that once again it has been given an attractive green colour scheme. We would have liked to see more than one ventilation panel, however, but the large and wide double hinged doors can be left open on a hot day to allow extra air to circulate around the plants inside. Whilst plastic glazing, such as polycarbonate, has excellent insulation properties for keeping greenhouses warm, glass allows more light and heat to enter the interior, which is one reason why it remains the number one glazing choice for serious gardeners. The toughened safety glass used in this B&Q greenhouse also brings the advantage of being essentially shatter proof, which is a boost to both greenhouse security and the health of safety of people in and around it. In many ways the eight foot by ten foot growing area inside these greenhouses is ideal for small to medium sized gardens, as there is room for a lot of plants inside yet it won’t take over too much of the garden itself. It’s sure to make an attractive addition to the garden as well, as we were very taken with its curved eaves that give it an onion like appearance. In conjunction with the green colour scheme applied to the aluminium frame, we found this to be a visually appealing combination. 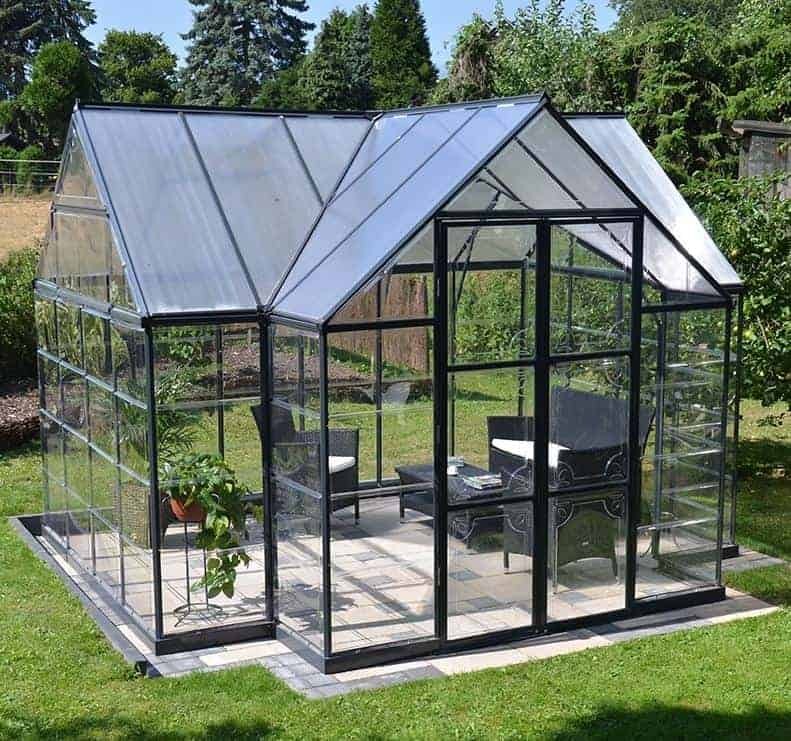 We would have liked to see an extended warranty offered with this greenhouse, however, and with a relatively high price tag attached as well it has to be content with a place inside our final three positions. 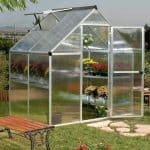 As we’ve already seen, high quality greenhouses not only come in all different styles but in all different sizes too. 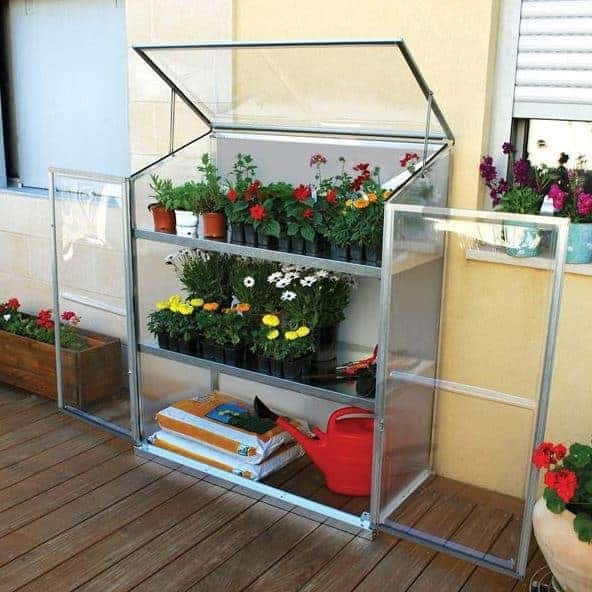 This compact greenhouse may not be suitable for growing larger plants, or for fruit such as tomatoes, but it’s ideal for the growth and display of potted flowers. The glass frontage not only allows lots of heat and light to reach the plants, which are essential ingredients for their growth, it also means that they are perfectly displayed for you and your guests to enjoy. 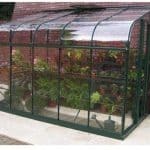 The aluminium frame of these wall garden style mini greenhouses is arranged in a tear shape that we found very eye catching, so that the greenhouse complements the natural beauty of the plants within it. We were pleased to find that the glazing used inside the frame was toughened safety glass as well, as that’s something that we wouldn’t ordinarily expect to find in such a compact greenhouse. We were also impressed at the way the glass is designed simply to clip into place, which should make this one of the easiest to assemble greenhouses that we’ve seen. Only the slightly than higher price tag, considering its compact dimensions, and the lack of a long warranty period stops this from climbing further up our WhatShed league table. 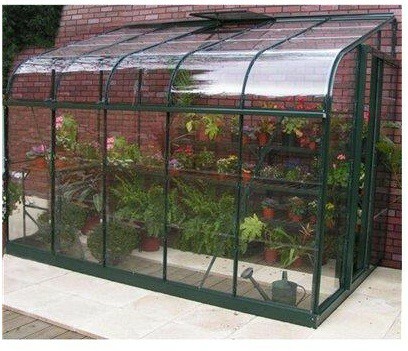 Why have four or six sided greenhouses when a high quality eight sided greenhouse such as this one from Fawt is available? The octagonal design is very rarely deployed in greenhouses, and for that reason we found it particularly striking, especially as it has been given the dark green paintwork shared by so many of the top quality greenhouses in our league table. It also means that the greenhouse has extra width available in which to store and grow plants, as shown by its base area of 6’4 by 8’11. We were pleased to see that these greenhouses have two opening side windows, and that they have two base vents built in. This means that not only should they be pleasant to spend time in even on sunny and hot days, they should also ensure that the interior doesn’t become so hot that it becomes injurious to plants. We also like the number of optional extras available to the customer, allowing them to get the greenhouse they really want. These options include using toughened safety glass throughout, adding staging and shelves, or adding autovents for even more ventilation. These come at an additional price, of course, and it’s the already high price tag which keeps this in the twentieth and final spot in our WhatShed league table.